PEX Adapter, 1/2" PEX x 1/2" Sweat Fittings. For adapting copper pipe to Central PEX pipe. 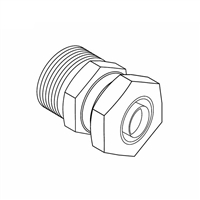 Female Adapter, 1/2" barb x 1/2 sweat fittings. Adapts 1/2" copper pipe to 1/2" Central PEX pipe. Sweat end fits over copper pipe. Can be used with Stainless Steel Radiant Manifold Kits. Male Adapter, 3/4" sweat x 3/4" MIP fittings For adapting copper pipe to Central PEX tube. Adapter, Brass, 3/4" male hose x 3/4" male pipe PEX Adapter, 1/2" PEX x 1/2" FIP Fittings. For adapting copper pipe to Central PEX pipe. PEX 25mm stainless steel hose clamp. For adapting threaded pipe to Central PEX pipe. PEX Adapter, Brass, 1" PEX x 3/4" MIP fittings PEX Adapter, 1/2" PEX x 3/4" MIP Fittings. For adapting threaded pipe to Central PEX pipe. PEX 90? Adapter Elbow for coupling 1" Central PEX pipe to 3/4" MPT threaded pipe. Push-fit, Connector Straight, 3/4" x 3/4" MIP PEX Adapter, 1" PEX x 1" Sweat Fittings. For adapting copper pipe to Central PEX tube. Brass adapter clamps for PEX pipe. Brass Clamp Adapter, 1"
Female Adapter, Copper, 1" sweat x 3/4" FIP fittings. May be used with Manifold p/n 1329 and 1349. Push-fit, Male Adapter, 1" x 3/4" MPT The diverter tee is an excellent sweat fitting used mainly with fan-forced heaters. Note: Central Boiler lists its 1" Pex products by their nominal outside diameters (the industry standard method), but lists its 1-1/4" Pex products by their inside diameters. All Central Boiler fittings listed for 1-1/4" Pex, including this product, are actually 1-1/2" Pex fittings. (The MIP side of this fitting is 1-1/4".) If this product will be used with Central Boiler 1-1/4" ThermoPEX or other Central Boiler branded 1-1/4" Pex line, then it will fit. However, this fitting will not work with industry-standard 1-1/4" Pex lines but will work with 1-1/2" standard Pex lines. Brass adapter clamps for PEX pipe. Brass Clamp Adapter, 1-1/4"
Note: Central Boiler lists its 1" Pex products by their nominal outside diameters (the industry standard method), but lists its 1-1/4" Pex products by their inside diameters. All Central Boiler fittings listed for 1-1/4" Pex, including this product, are actually 1-1/2" Pex fittings. (The MPT side of this fitting is 1-1/4".) If this product will be used with Central Boiler 1-1/4" ThermoPEX or other Central Boiler branded 1-1/4" Pex line, then it will fit. However, this fitting will not work with industry-standard 1-1/4" Pex lines but will work with 1-1/2" standard Pex lines.